Movement handles in dress & Skirt. Fit Morph in Jacket. Thank you; this will be helpful for my son's school project. I understand, and you do them beautifully. The outfits you make are really great. I just hope you do a few more historical ones, I never got the Native American outfits to work, but no other glitches I know of... PS: I wish you'd consider going on that religious journey some time and put out the full range. Cheers! 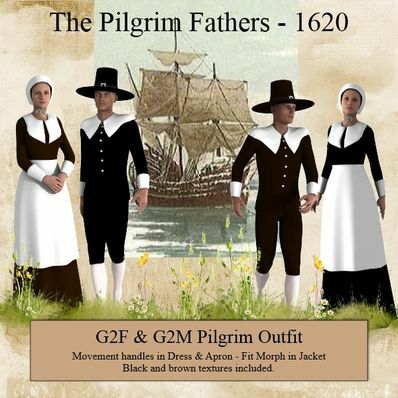 @Baghool - I have never really classed the Pilgrim Fathers as Religeous, even though they are. These wre just part of my Historical outfits. I will not make any religeous outfits because if I did one particular religeon I would have to do them all. I mainly make everyday items, for now, and the past. Modelling is good, very beautiful. Thank you very much! Dude, so impressed with all the content for the site. Huge thanks, and donation incoming. You deserve it! Thank you very much! This site must have been a LOT of work!